As genealogists, we often find ourselves challenged by elusive ancestors and sketchy information. We gaze at our sources, whether records or photographs, hoping the information we seek will magically leap off the page. 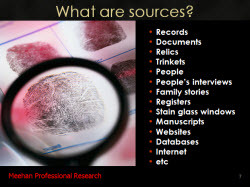 To build evidence, genealogists must evaluate each piece of information separately asking who furnished this information and why. Join Lyn, and learn the GPS of Information Processing. Demystify the definitions of sources, information, evidence and proof as she demonstrates through direct and indirect information how evidence analysis works.